Shumatsu Distortion visited , which is known as the global forum for design. The fair brings together the most influential collectors, gallerists, designers, curators and critics from around the world in celebration of design culture and commerce. 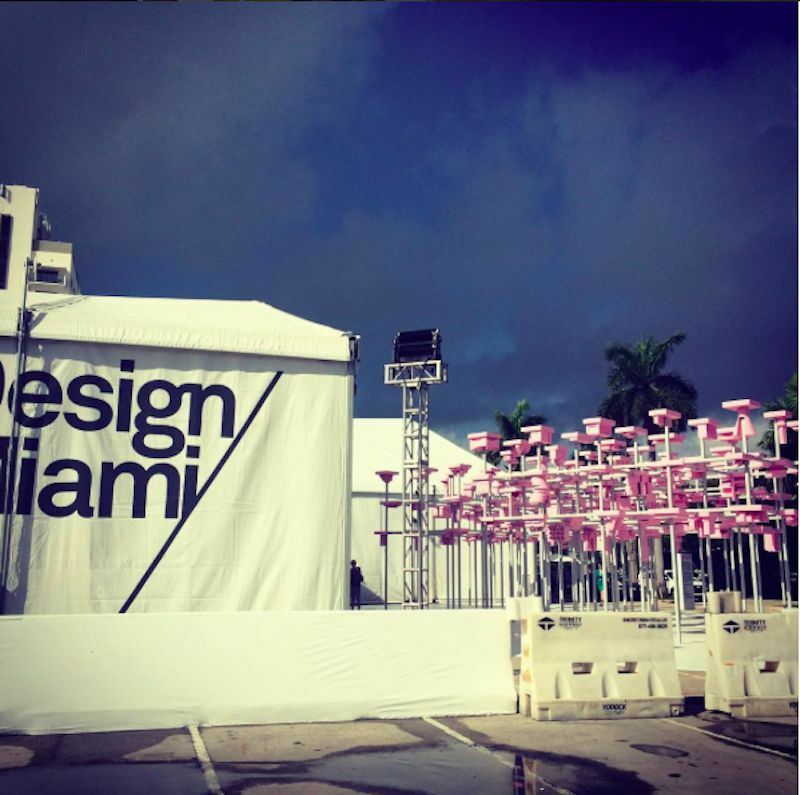 Because it takes places alongside , Design Miami/ has become the premier venue for collecting, exhibiting, discussing and creating collectible design. 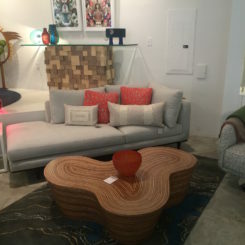 We saw remarkable furnishings as well as unusual home decor pieces. 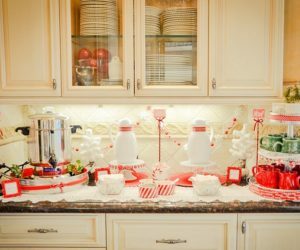 Some are eminently practical and functional, others pure whimsy and fun. The fascinating jumble of a light fixture is by Dutch artist Joris Laarman. 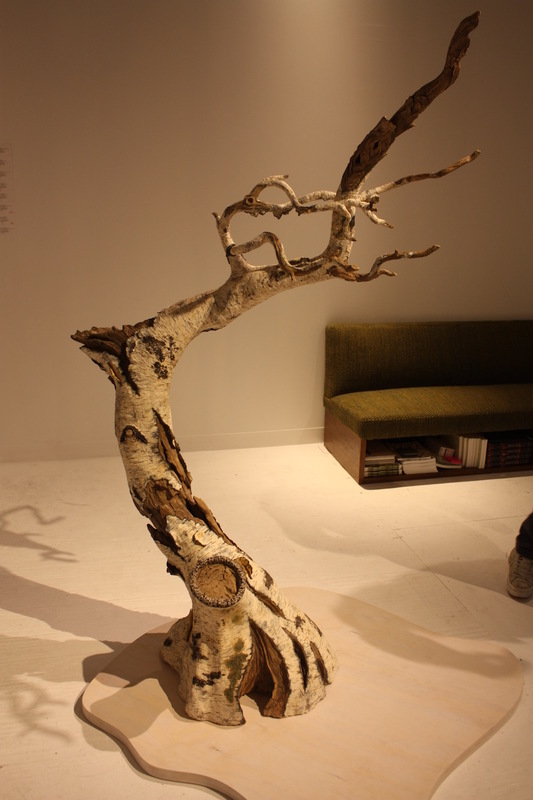 , whom we saw at The Salon Art + Design in New York, was also showing in Miami. 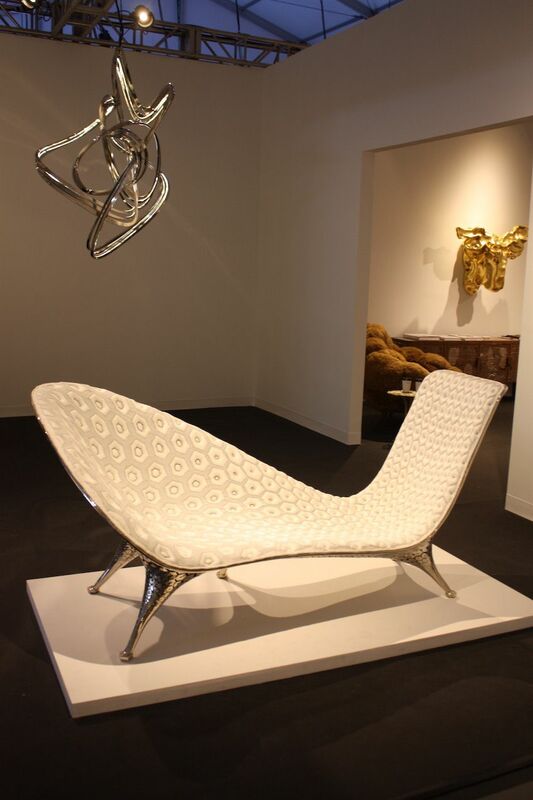 This elegant and seductively curved chaise was a real stunner, thanks to the interesting legs as well as the uniquely tufted upholstery. 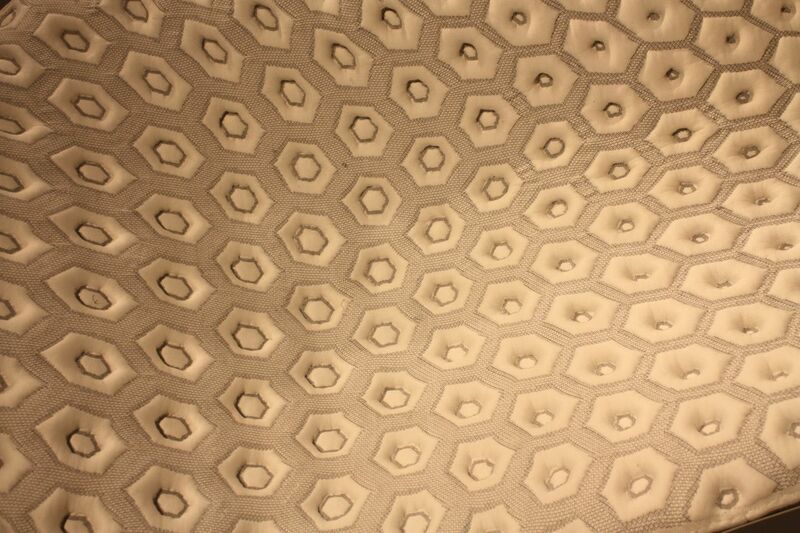 The upholstery on the lounge has an unusual pentagonal tufting design. 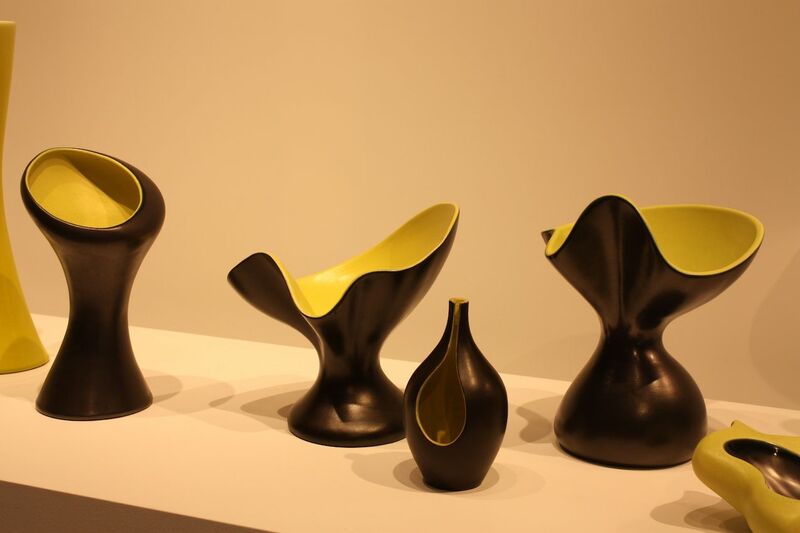 Designer Satyendra Pakhalé created this chair. He calls himself a “cultural nomad” having grown up in India, trained in India and Switzerland, and worked internationally for two decades. 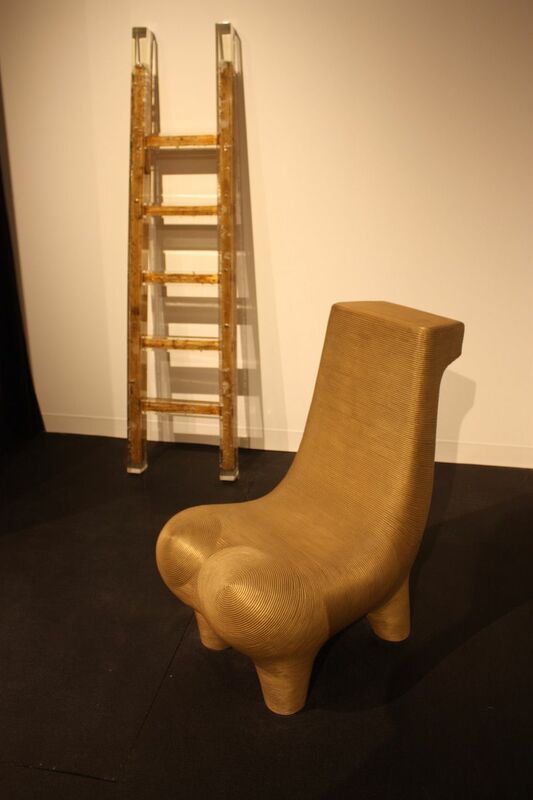 was another repeat exhibitor from New York, only this time the gallery also showed this unusual chair in sandblasted bronze, along with work from Studio Nucleo, such as the ladder against the wall. The Italian studio has developed a method to capture antique wooden pieces, such as the ladder, inside resin. 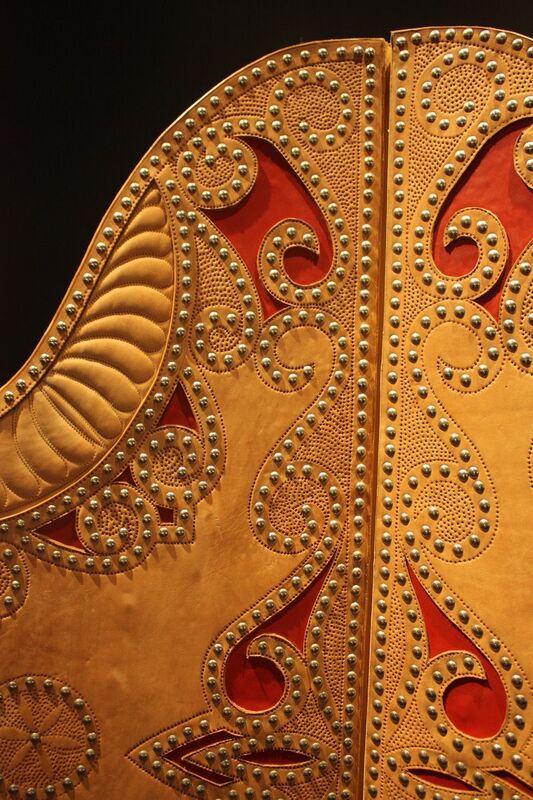 The detailing in his horse chair is perfection. The Chamber exhibit was dark and mysterious. This bench was the focal point, a sleek but substantial piece. showed this collection called Black Gold by Quintus Kropholler. Created using asphalt and stone, Kropholler’s pieces are dark and intriguing. 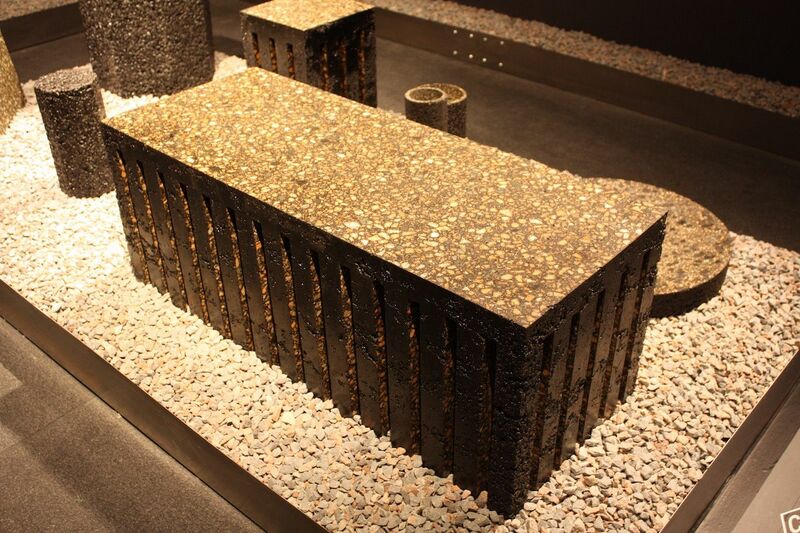 These modern pieces vary in color and texture according to the stones used. 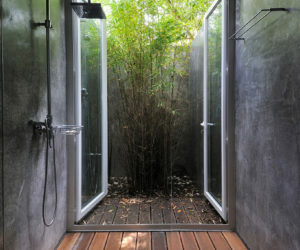 They are designed for indoor use, but could also be placed outdoors. Designer/Artist Yinka Shonibare was born in London and moved to Lagos, Nigeria at the age of three. He returned to London to study Fine Art. 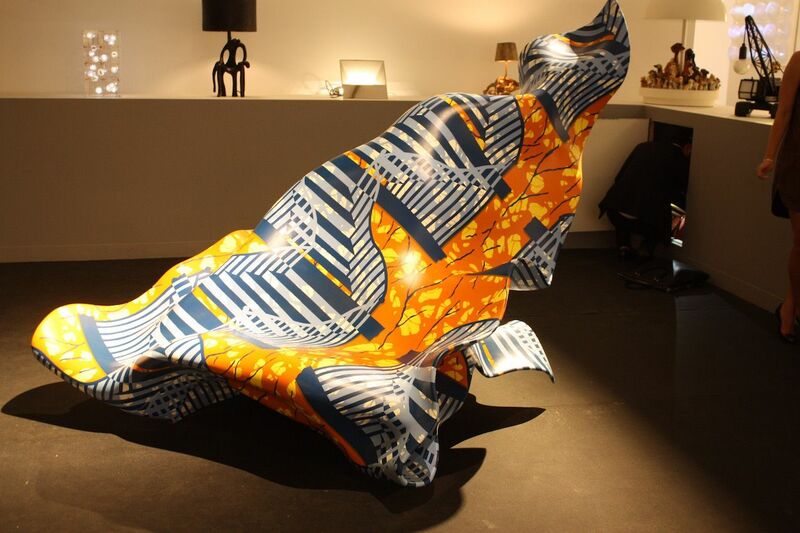 Yank Shonibare’s “Windy Chair” made of painted aluminum was the perfect intersection of art and design. This particular piece, presented by the , found it’s way into many promotional materials and show reviews. Dubourg created a limited edition of eight of these cabinets, four artist’s proofs. 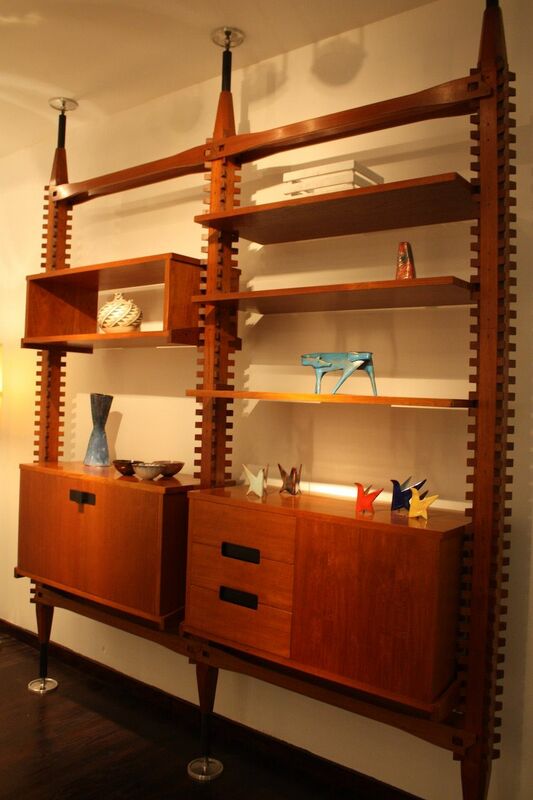 Carpenter’s Workshop Gallery also showed this impressive credenza from Vincent Dubourg. 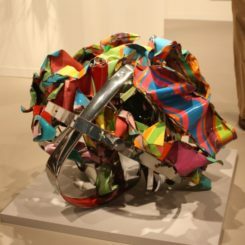 The artist often creates “deconstructed” forms, such as this one. He has been quoted as saying that “The destruction is necessary for the construction of a new order,” he says. “It is irreversible and necessary, just as in nature.” Whatever his artistic reasoning, we love the result. The gold fixture around each bulb, and the light directed at the wall, create a soft glow from this fine modern decor piece. 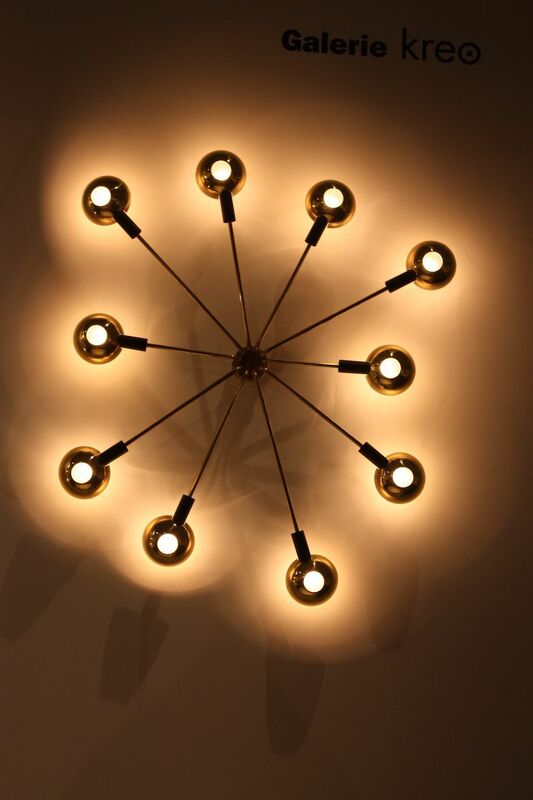 In another take on the sunburst light, exhibit included this piece that could make its home on a wall in just about any house. 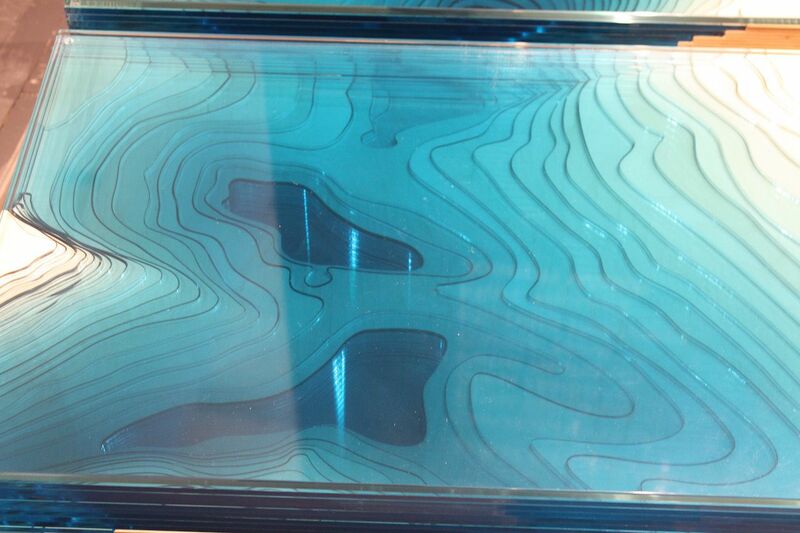 Christopher Duffy’s Atlantis Table in the booth attracted a great deal of attention. Functional, yet a stunning work of art, the table draws your attention and keeps it as you study the layers and depths of glass. 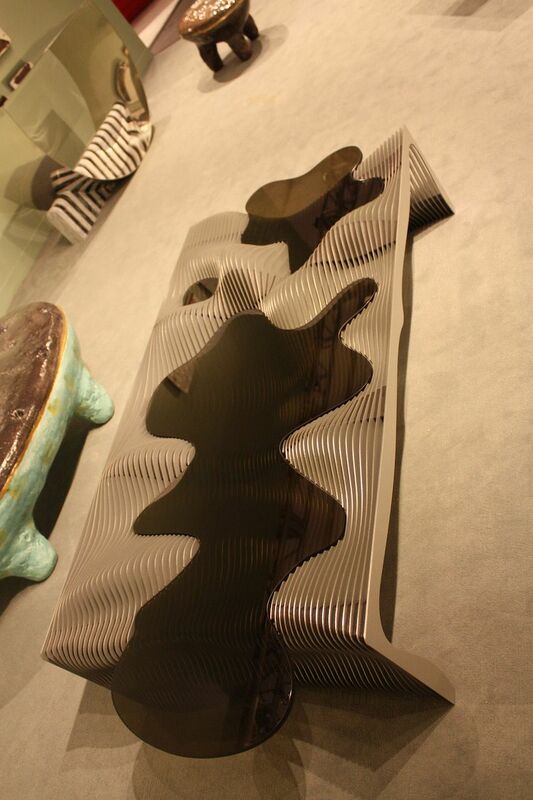 It was one of a number of innovative coffee table designs found throughout the fair. Kim Sang Hoon’s bio notes that he was barely out of school when his Phenomena screen became just that — a phenomenon. He is Korean-born, and is said to find inspiration in architecture. 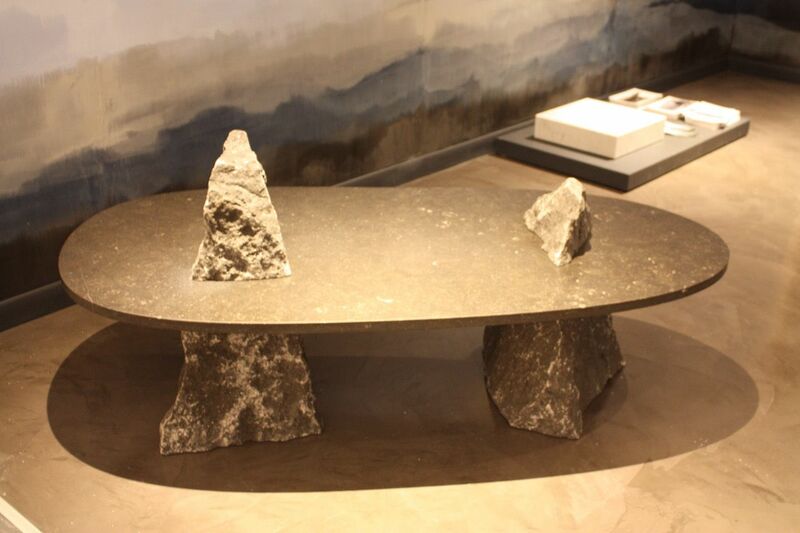 , a South Korean Gallery, has “introduced contemporary design that captures the values of Korea’s naturalistic aesthetics and artisanship.” This is Table+Glass by Korean designer Kim Sang Hoon. 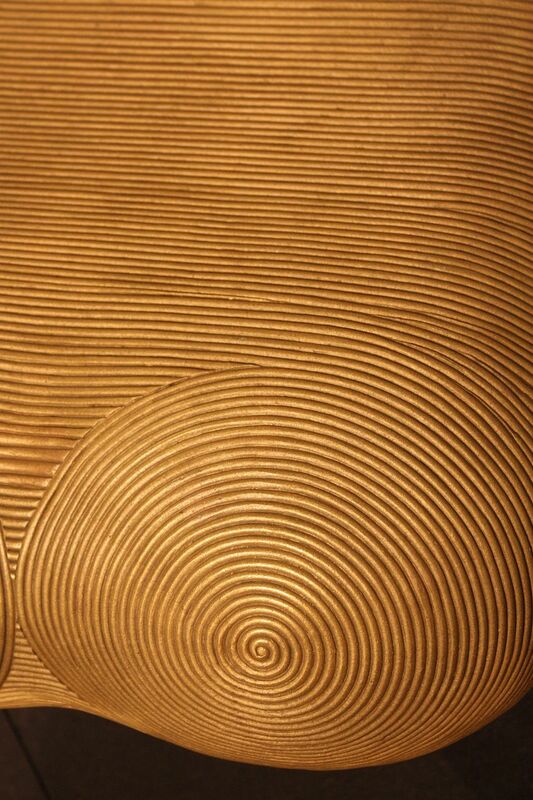 The undulating surface made of separate wood pieces gives it so many interesting dimensions — like a rolling landscape of hills surrounding bodies of water. From every angle, the Table+Glass offers dimension and interest. Jasper Brinton, designer and woodworker, was born in 1938 in Alexandria, Egypt, of American parents and raised in the Middle East. 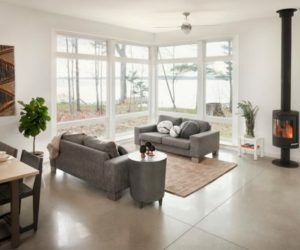 He now lives in an old schoolhouse in rural Pennsylvania, and has enjoyed a 40-year year career centered around contemporary furniture and its functional design. 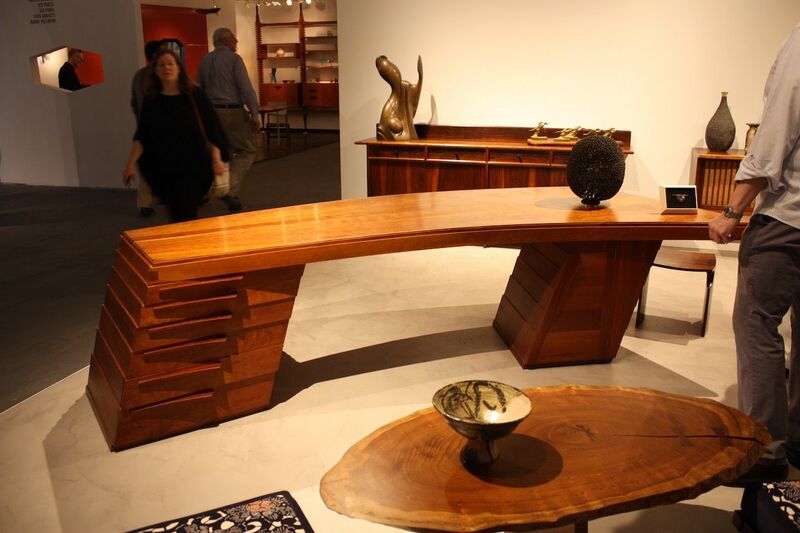 Not only is the gorgeous wood of this desk striking, the skewed geometry of the piece shown by is so different. In this case, the form does not hinder the function. 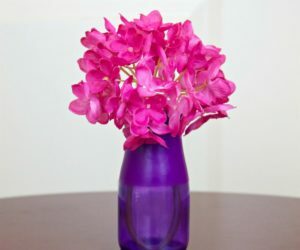 It would be a marvelous addition to any office setting at home or in a business. 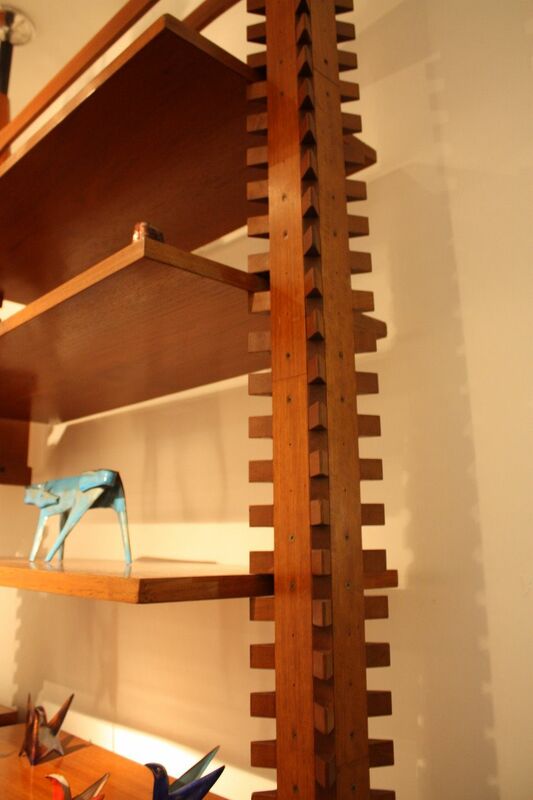 This shelf is simple and clean, but still incorporates amazing wood detail work along the vertical lines. 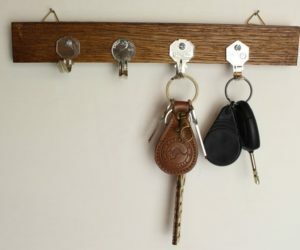 Thanks to the tension posts, it is spare, standing on three single legs. The booth featured its ongoing exhibition series called REFLECTIONS. It recreates the interior of a 1955 Milanese residence decorated by Attilio Colonel that is interpreted from historic drawings and photographs. 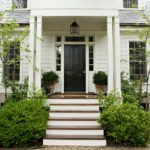 The detail along the vertical posts brings transforms the piece from basic to brilliant. Made of red-stained elm, the chairs are secured with brass screws. Rietveld was a Dutch furniture designer and architect who was one of the principal members of the Dutch artistic movement called De Stijl. 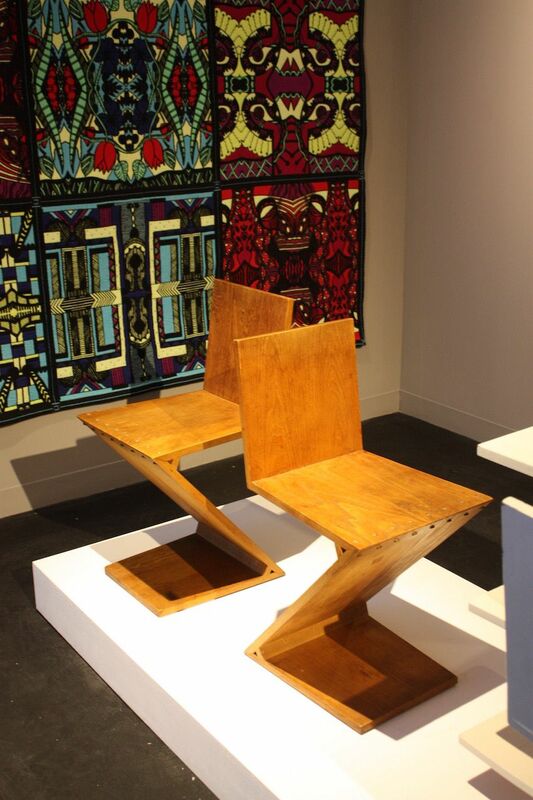 featured an eclectic mix that included these Zig Zag chairs design by Gerrit Th. Rietveld in 1935. This chair is a good example of great design: It has lasted for close to a century and is still as appealing and relevant as it was when created. Made of lacquered wood and incorporating a mechanical elevation system, this coffee table has a perimeter that can be raised to form a cocktail table. 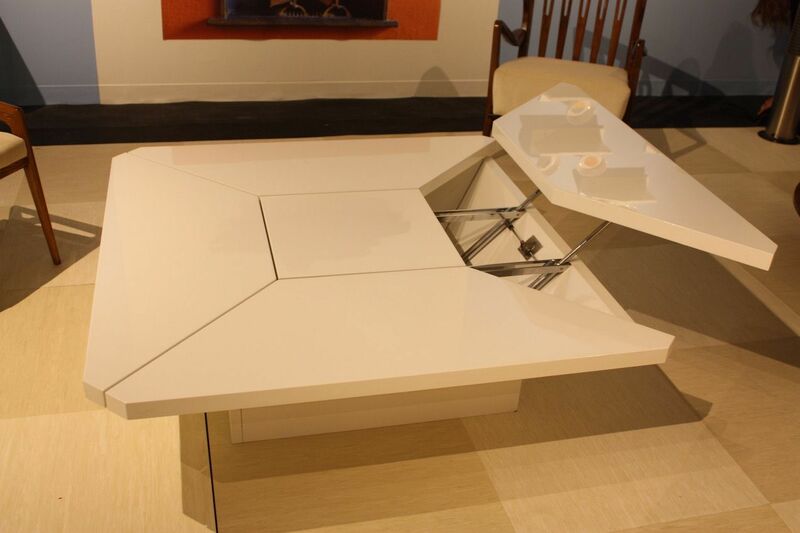 This Coclea Table presented by from Turin, Italy, looks like it was designed for today’s smaller spaces because of it’s mechanical elevation system, Instead, it’s a design from the 1970’s by Francesco Cocchia, and produced by architect Claudio Sormani. 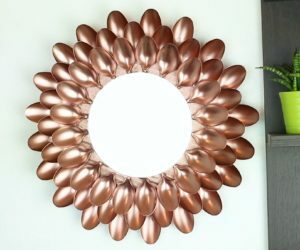 Its sleek look is very current and appropriate in any modern home decor. 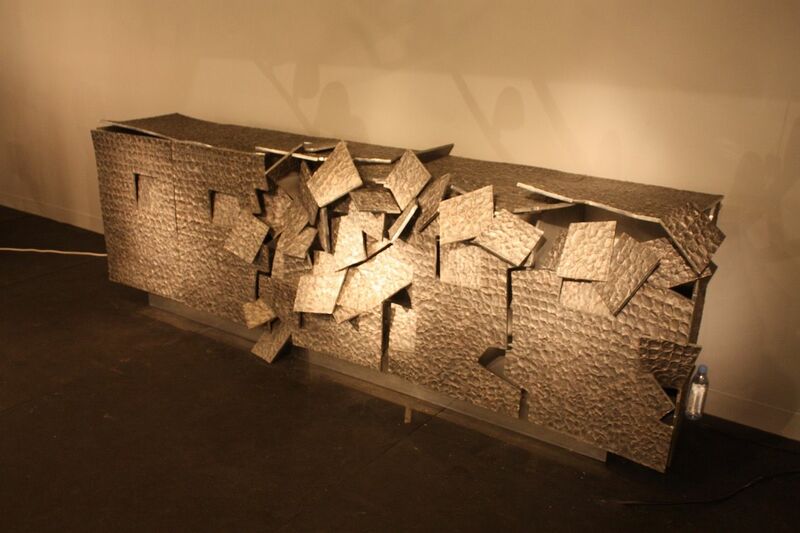 According to the gallery’s description, the inspiration of the Off-Railing Series comes from the New York City subway system. 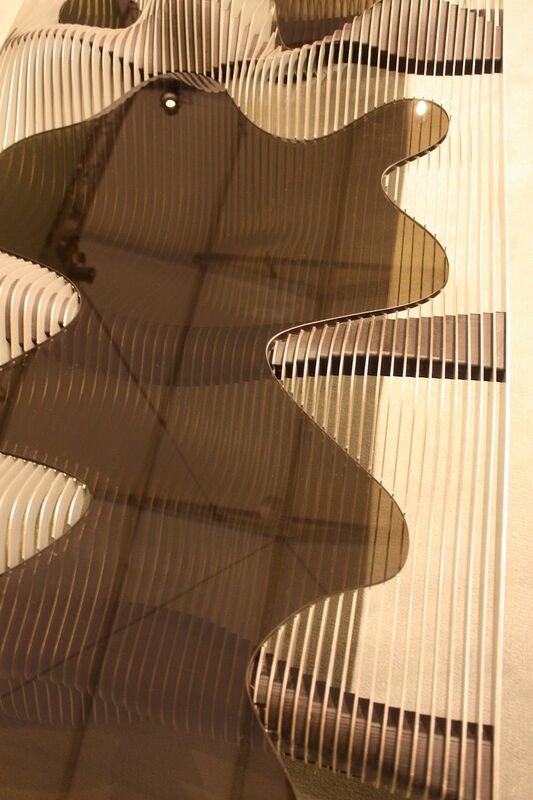 It is based on simple curves that connect with each other. 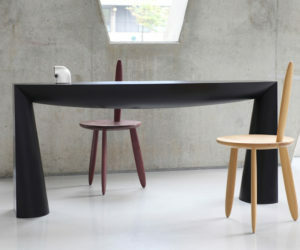 The shape can be expanded infinitely, from something as small as a stool to a structure as large as architecture. 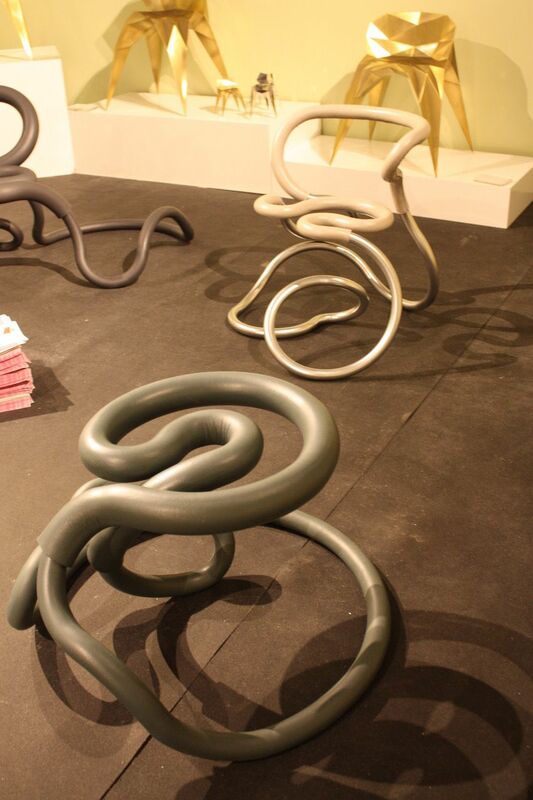 More than a mere squiggle, these innovative stools for are pure fun. They are part of the Off-Railing Collection by Aranda\Lasch, 2015. Materials include anodized aluminum and rubberized foam padding. Founded in 2013, Gallery ALL is one of the first design galleries in China dedicated to exhibiting collectible design. It also maintains a gallery space in Los Angeles. This is an armoire from the Cangaço Collection, which is named after Brazilian bandits in the late 19th and early 20th century. One of the hotly anticipated displays was from , the first Brazilian gallery to participate. 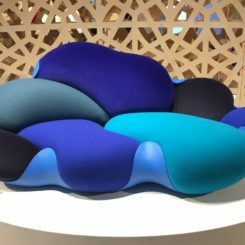 The Sao Paolo-based gallery brought a solo show of limited edition leather furniture by longtime collaborators, the . The pair is known as the godfathers of contemporary Brazilian design. The colorful collection focuses on the skills of traditional saddlery, but brings together stitching, traditional designs, complex patterns and a wide array of details. Together, it makes a very fancy and evocative collection. 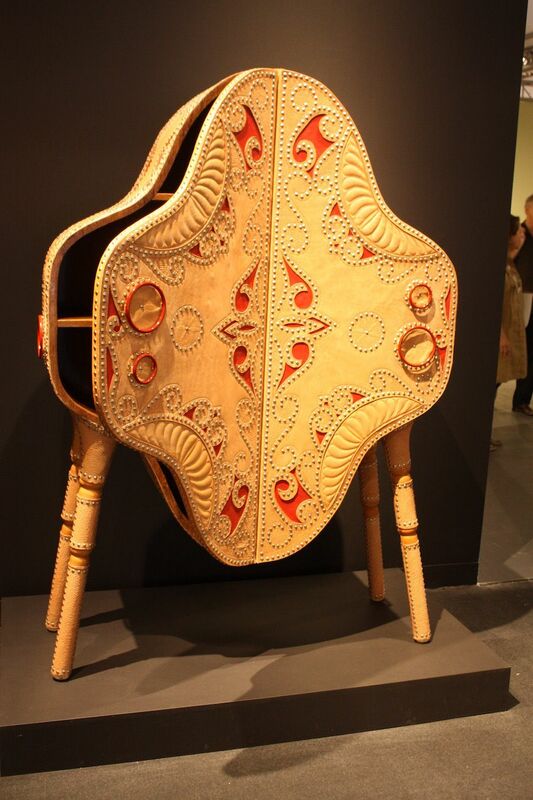 The detailed leather work on the furniture designs is by leather craftsman Espedito Seleiro, who uses plant- and clay-dyed hides. The infamous highwaymen were known for wearing richly embossed leather clothing. 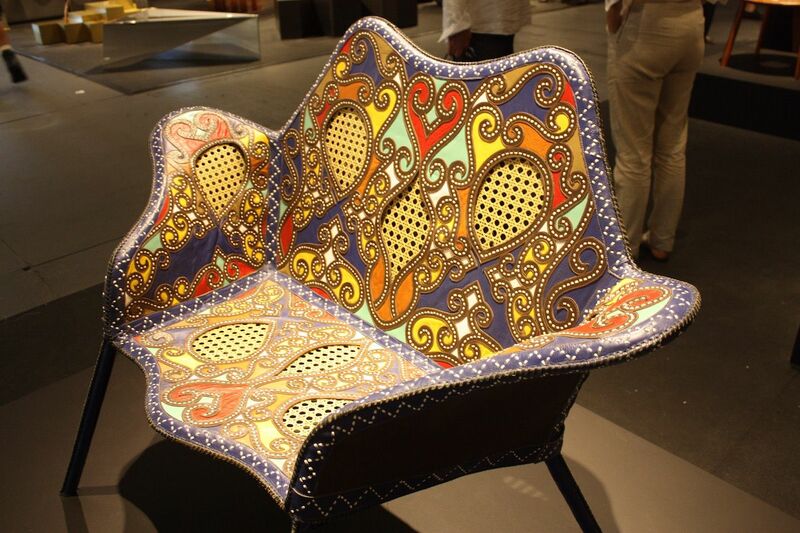 This vibrant chair is an explosion of color and texture. 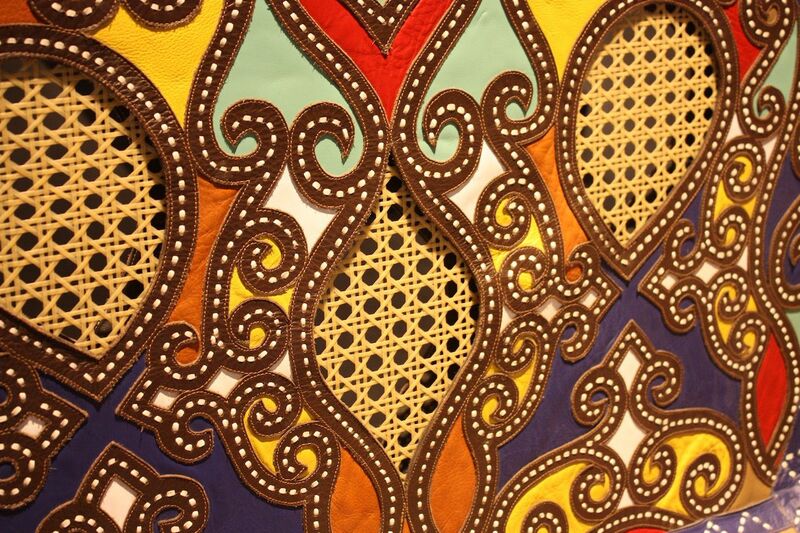 Magnificent detail is present through the collection. 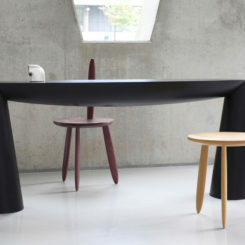 This table by Potts is similar to one featured in the New York Times Style Magazine. A particularly interesting display was . The installation included new and exclusively commissioned work from Dutch designer Lex Pott, who is known for his reinterpretation of basic geometric shapes. 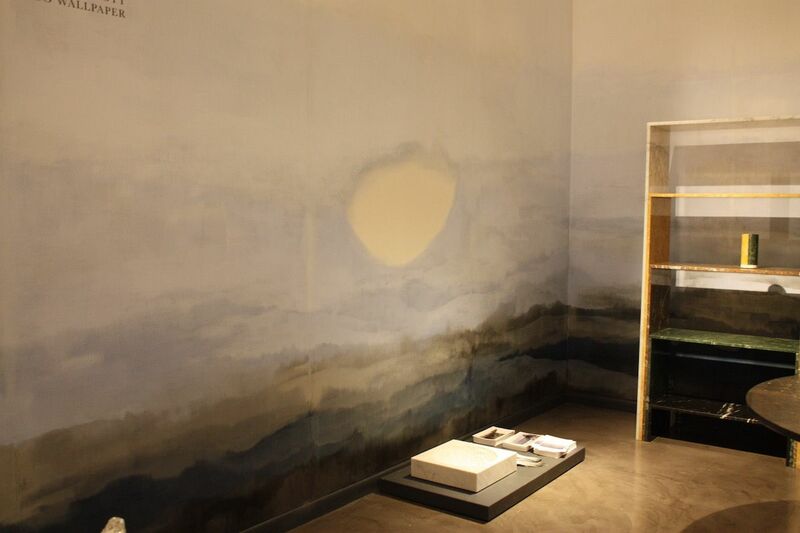 The walls of the exhibit space were covered a special linen covering that was hand painted by New York-based Calico Wallpaper, created in collaboration with The Future Perfect founder David Alhadeff. 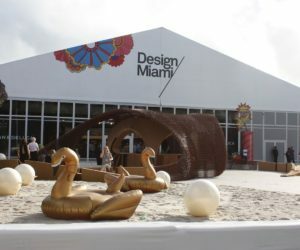 The painting was done live at Design Miami/ and the paint used is made from pigments based on the same stones used in the furniture displayed. Here the intricate shading of the wall murals is almost finished, save for the small circle of blank wall in the center. The artist painted the entire wall covering during the fair. 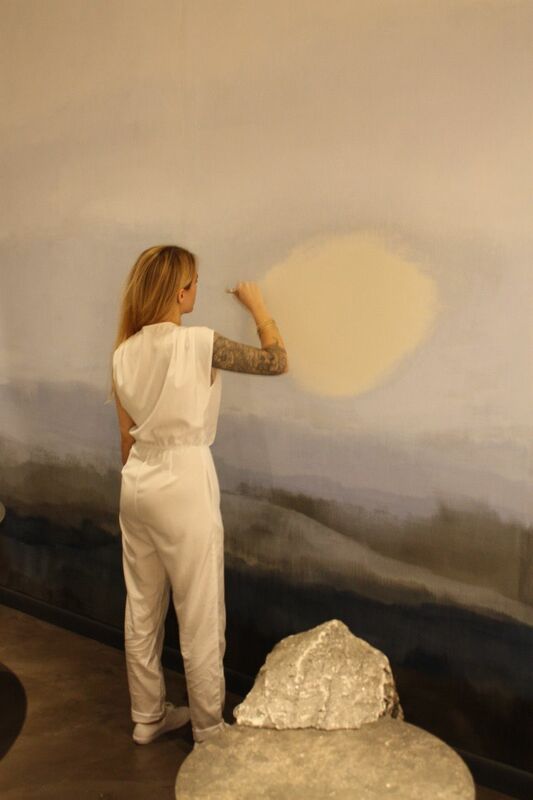 The studio offers this custom design service to its clients who would like a unique mural. 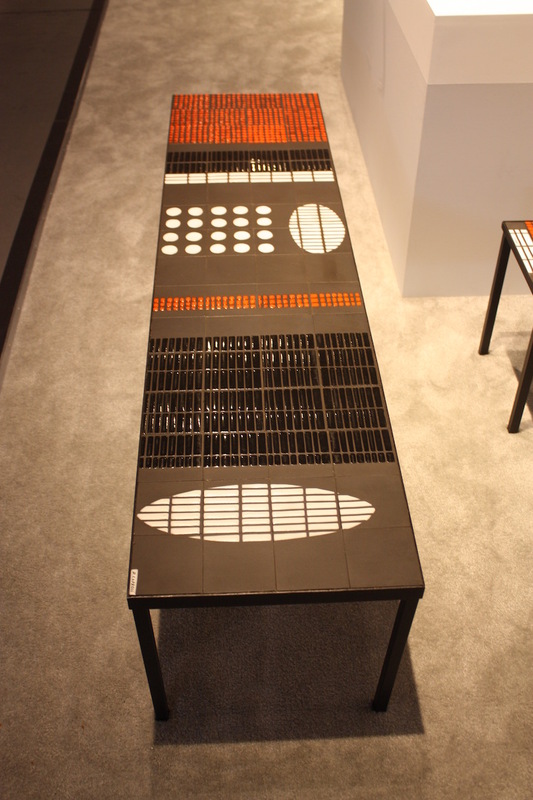 The table is enameled ceramic with red, black and white geometrical decor on a matte black background. The base is black metal. 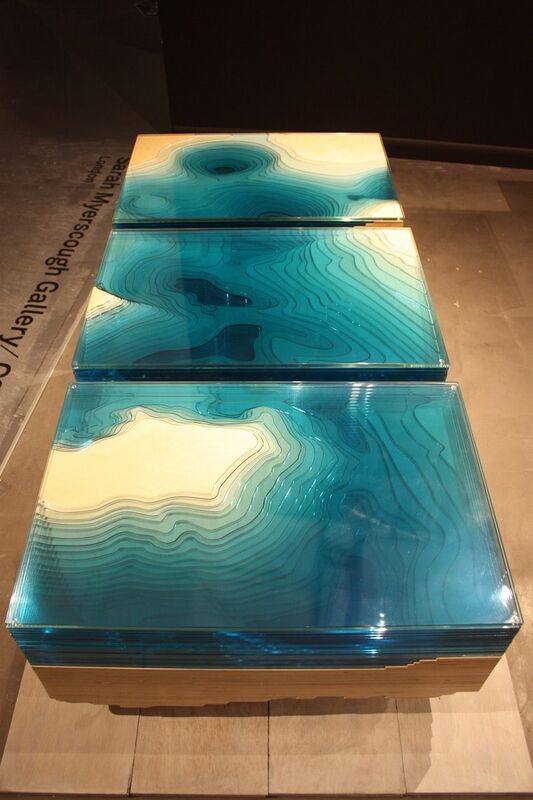 Ceramics were having a moment at Design Miami/ and the showed a collection of interesting tables, such as this one. 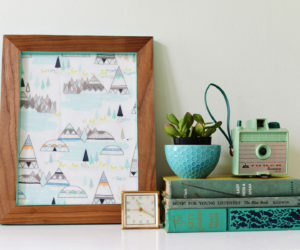 While this is a neutral piece, the pop of color keeps it from being boring. Designed by artist Roger Capron in 1955, it is a gorgeous modern piece. 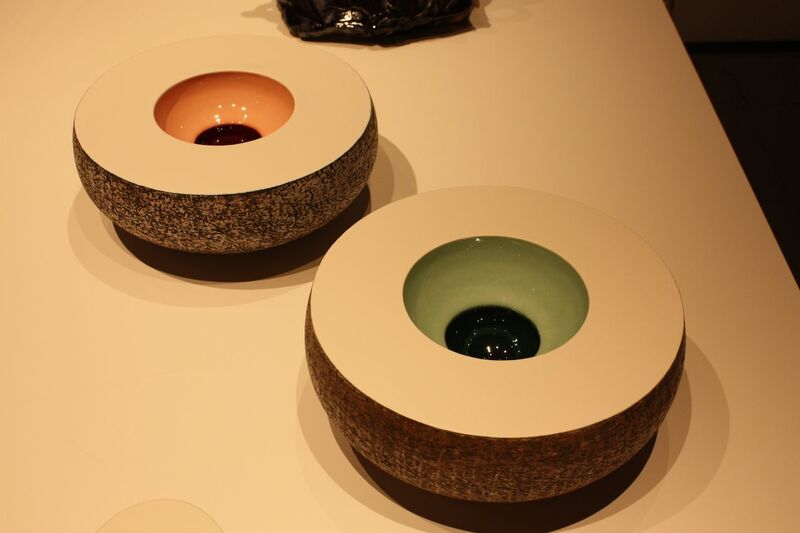 Fritsch also showed a wide range of ceramic vessels and objects, such as these by Artist Pol Chambost. Created in 1955, they are Black silver enameled ceramic with yellow interiors. Called Night and Day, these lights were a focus of the Giraud exhibit. 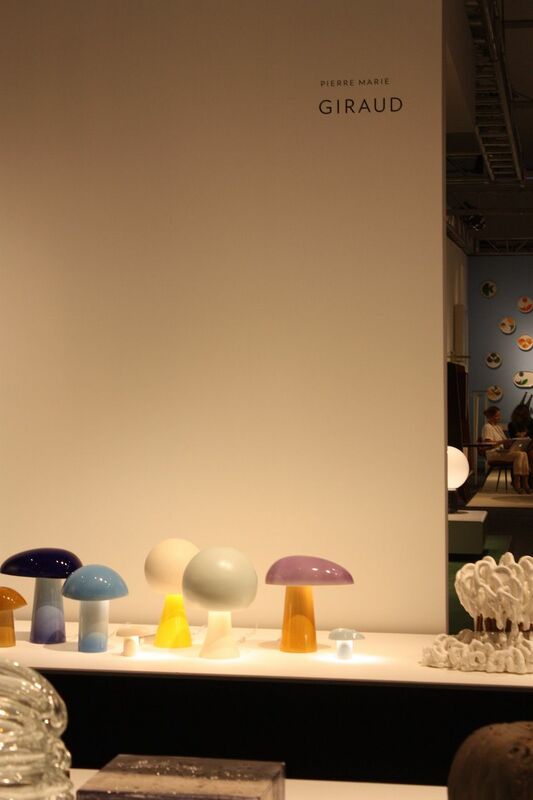 The from Brussels, which represents international artists working with glass, ceramics and silver, had a colorful and joyful display of objects and lighting. 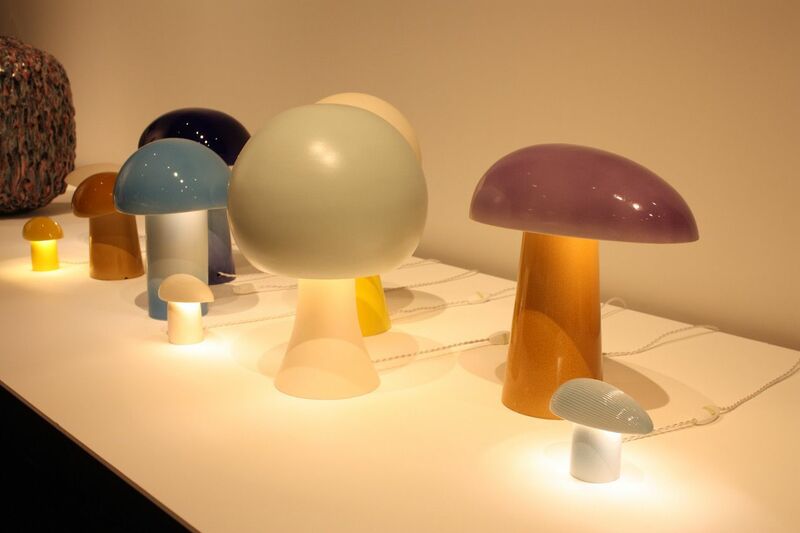 These mushroom-like lighting fixtures by Belgian Jos Devriendt were eye-catching with their soft colors and unique profiles. 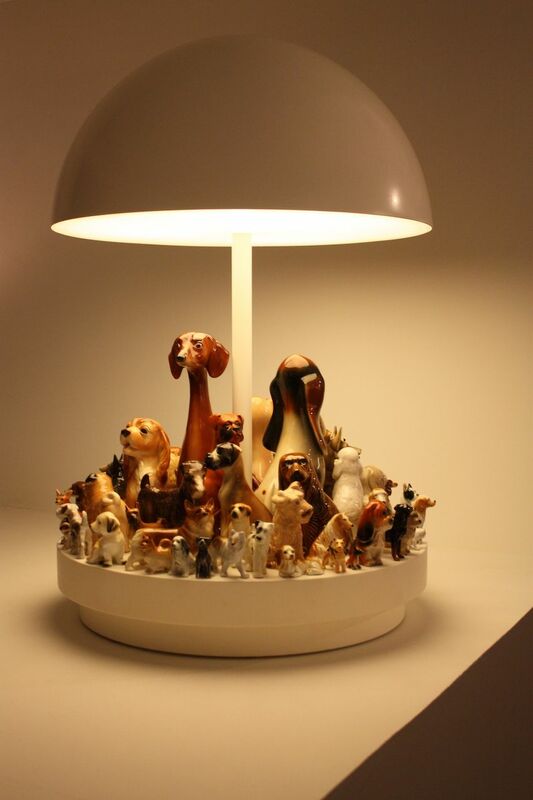 The range of shapes and sizes grouped together are part of the appeal of the lamps. Devriendt has also created all-white and metallic collections of these lights. The dimension that the color inside these bowls gives to the piece is striking. 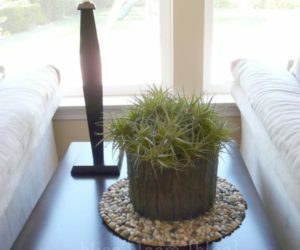 Alone or in a pair, they are a versatile yet special decor piece. This object by Danish artist Bente Skjöttgaard is one of the Cumulus Congests series, meant to evoke clouds. Created from stoneware and glaze, they are an unusual piece. Jason Jacques Inc. of New York presented Seritella’s amazing works. 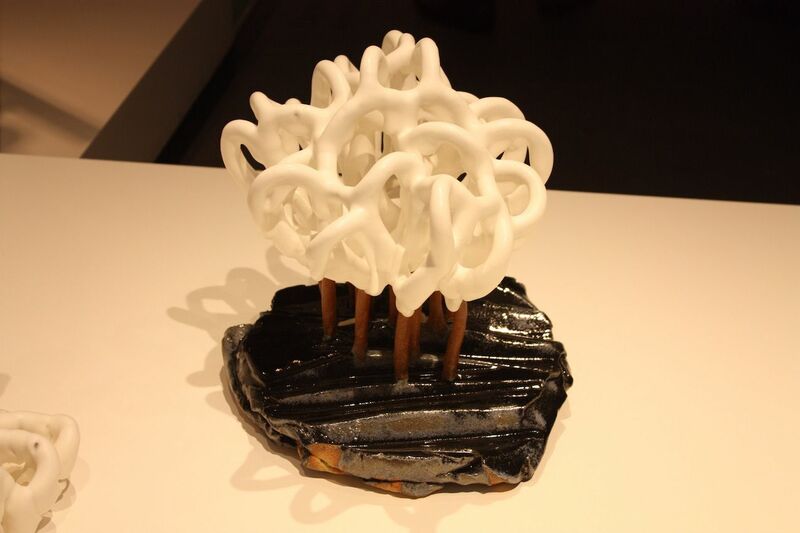 While this might look like just a tree branch, it is actually a masterpiece of clay. 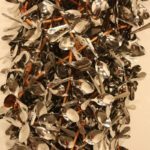 trompe l’oeil birch tree sculptures have been added to some of the world’s most important modern and contemporary art collections during the past three years, according to Jason Jacques Inc. The gallery commissioned this large-scale work, the artist’s first foray into sculptures of this size. Small or large, they are astounding to examine. Fantastical creatures and giant mushrooms straight out of a psychedelic dreamworld are intricately beaded. 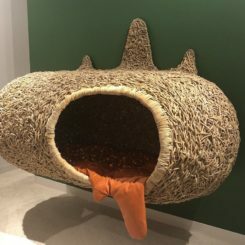 Perhaps because of its proximity to Art Basel across the street, there was plenty of whimsy to be found at Design Miami/. 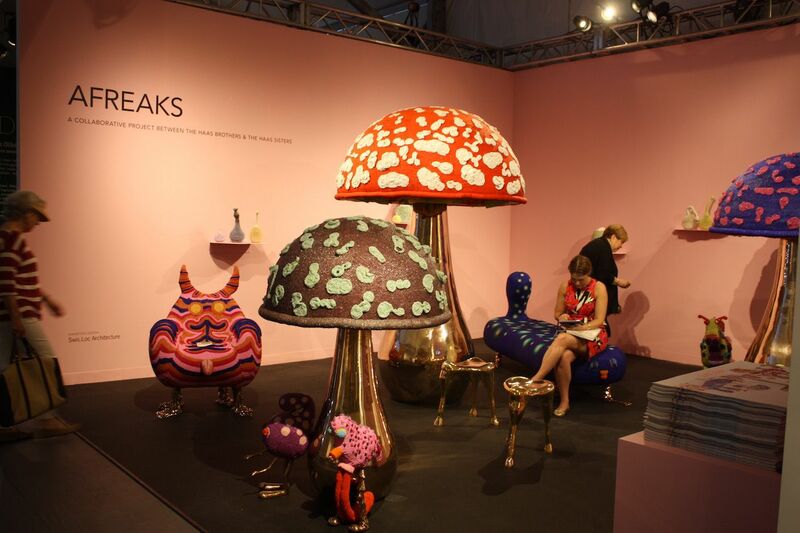 We were particularly excited to see the Afreaks collection from the Haas brothers, presented by . 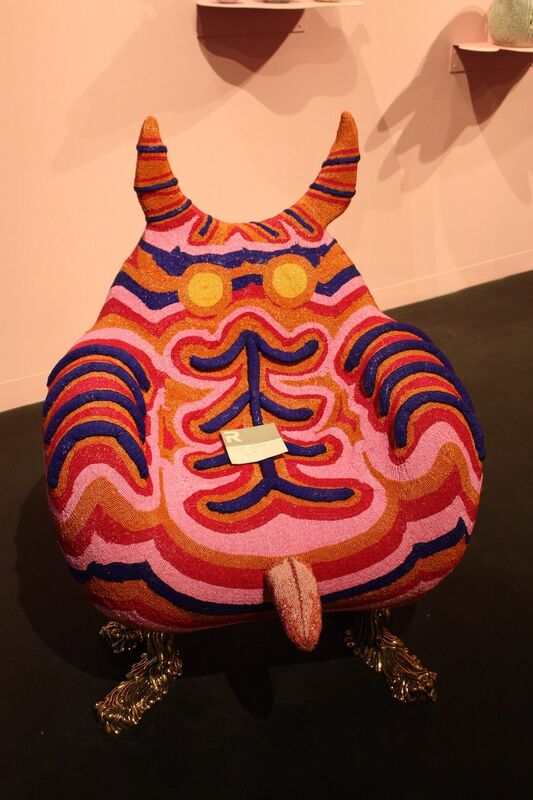 Rip Horn, one of the Freaks series, features a complex pattern, horns, raised beading and a lot of personality. The Haas Sisters, a group of women from South African townships, collaborate on the designs, doing the beading. 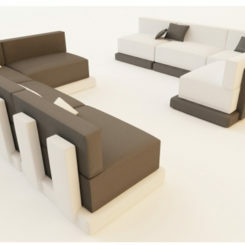 According to R and Company Gallery, the designs begins as sketches by Niki and Simon Haas. 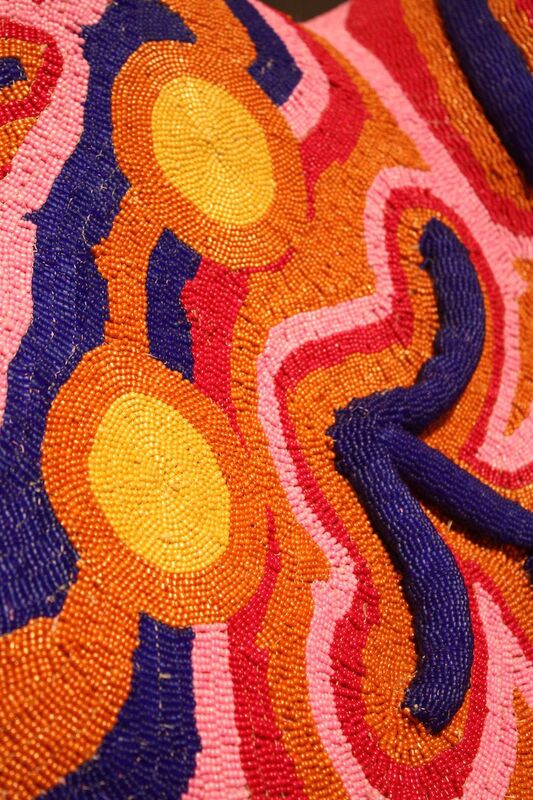 Then, the leaders imbue the beading prices with their own personal sense of color and pattern. “To create the three-dimensional detailing on the works, Simon Haas also developed beading algorithms that comprise a proprietary operating system based on the recreation and manipulation of patterns and rhythms found in nature,” says the description. The beading is detailed and precise. 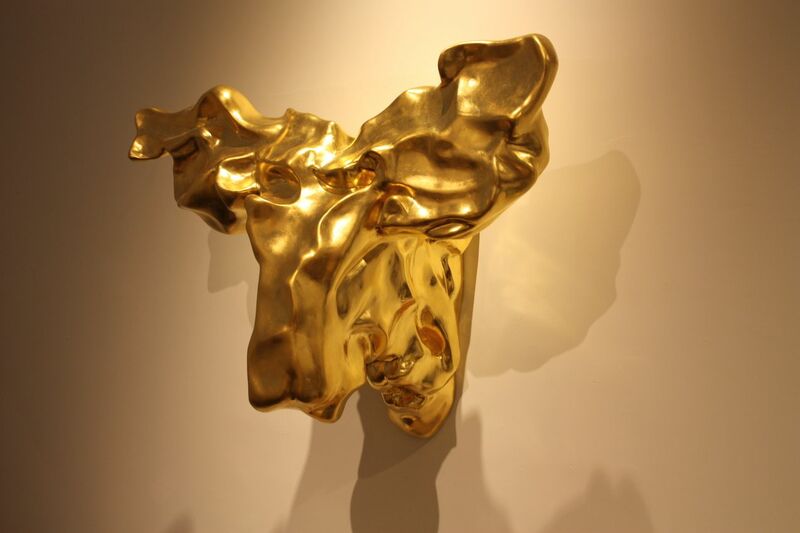 Better that the real thing is this funky gold, slightly abstract moose head…Who doesn’t want one of these? Stout’s work has been exhibited in Milan, Art Basel, and various galleries in New York City. 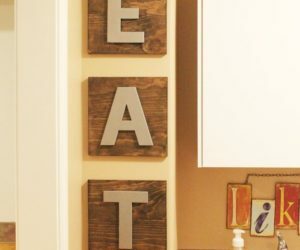 She was recently featured on Ellen’s Design Challenge, filmed in Los Angeles. 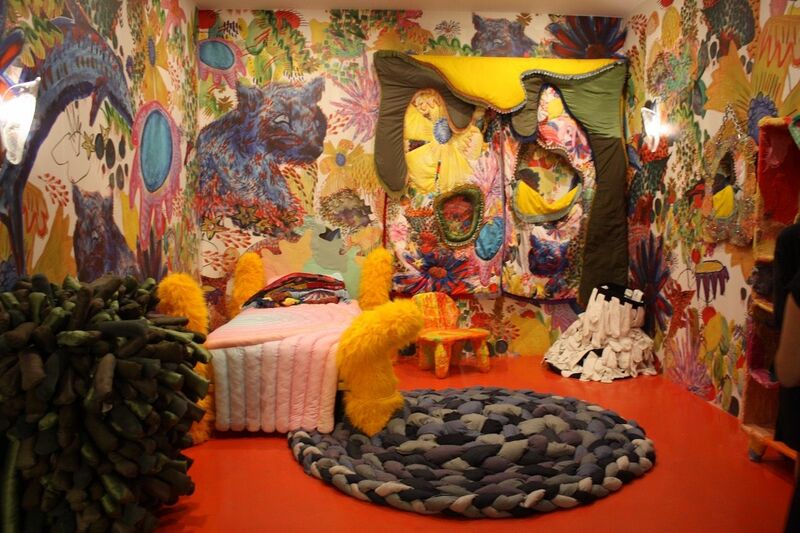 Speaking of fantastical and imaginative, here is room created by Brooklyn furniture designer . 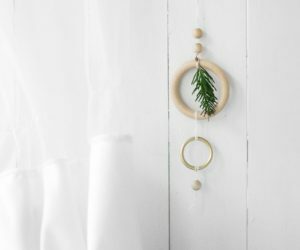 From the wild wallpaper and furry bedposts, to the light fixtures and braided rug of giant stuffed strands, the room is a childhood dream. 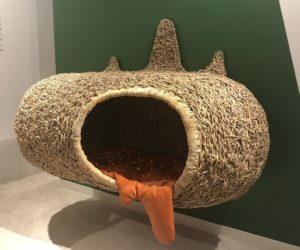 Created by Porky Hefer, the chair is made from leather and sheepskin. 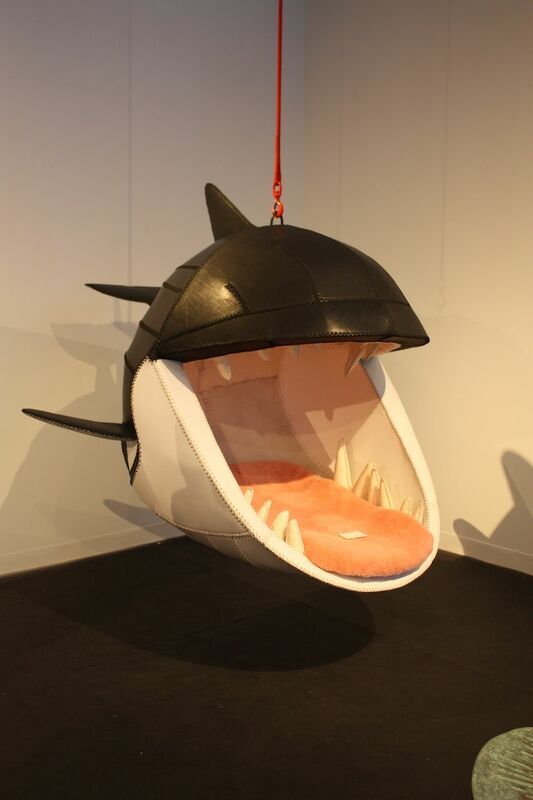 It took major restraint not to plop down in the Fiona Black Fish hanging chair presented by the of Cape Town South Africa.The Guild had numerous pieces that we’d love to have, but Fiona drew the most attention and was all over social media during the fair. Athirst glance it’s gym, but a closer look reveals unusual ceiling lights, stools and other furnishings. 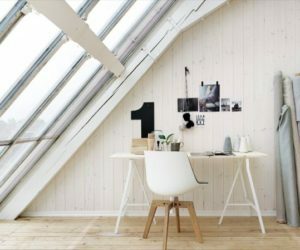 of Rome is a design platform that focuses on worldwide emerging designers and innovative projects. 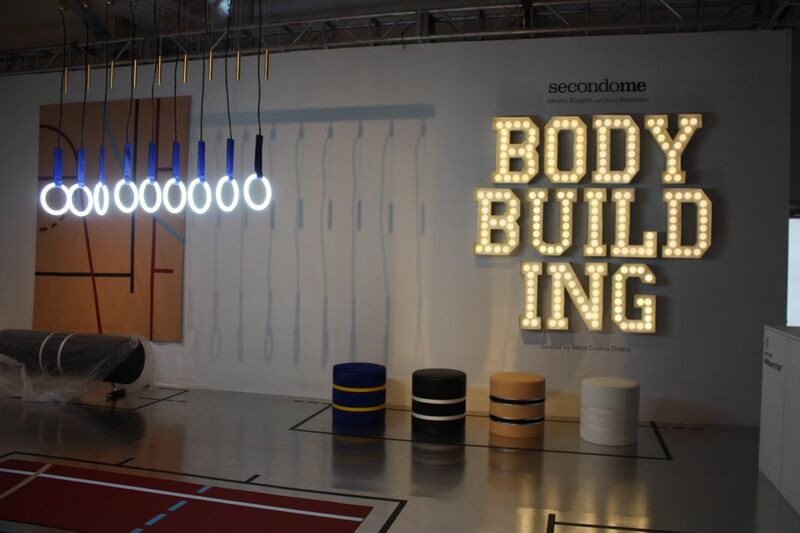 The studio’s exhibit at Design Miami/ features Body Building by Milan-based Italian design duo Alberto Biagetti and Laura Baldassari. The show “explores the idea of the body, its potential and the discipline of perfection…The Body Building “antigym” consists of unique pieces made of precious materials and exquisite details, executed with the incomparable precision synonymous of the excellence of Italy’s hand-made tradition,” says the gallery’s description. 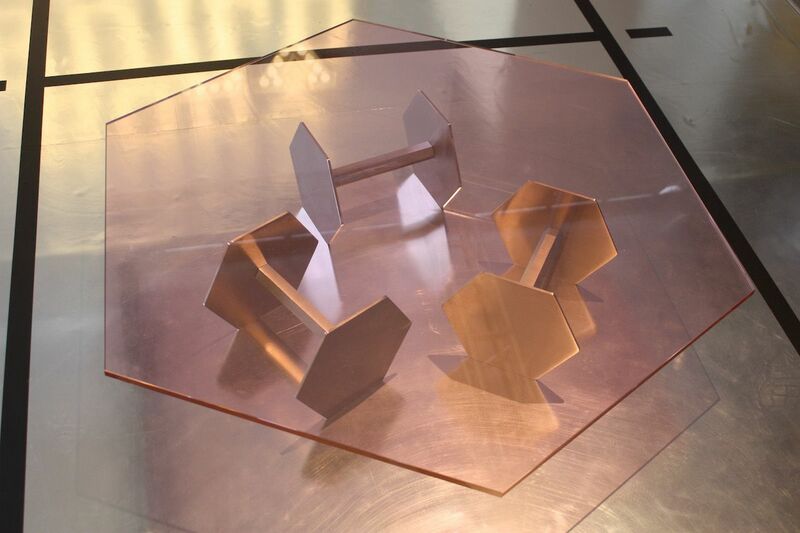 The Manubri coffee table has a base of brushed steel with a pink crystal top. 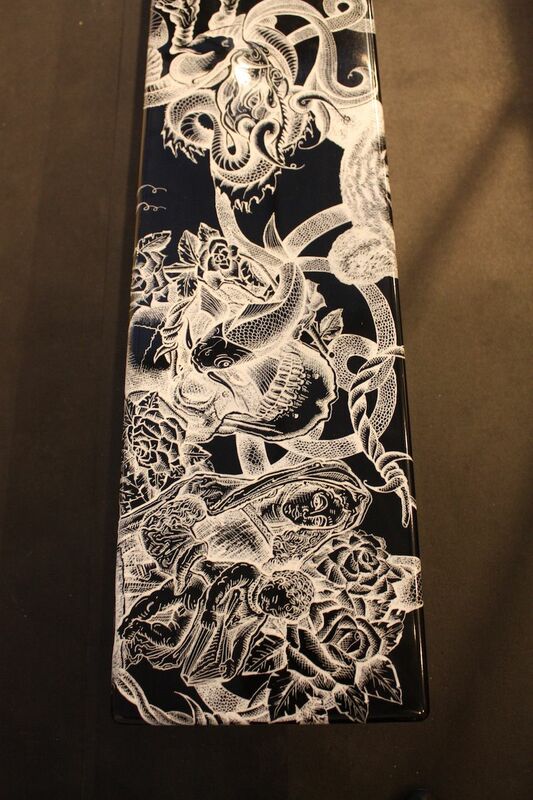 Long and lean, the bench features intricate tattoo-style designs. 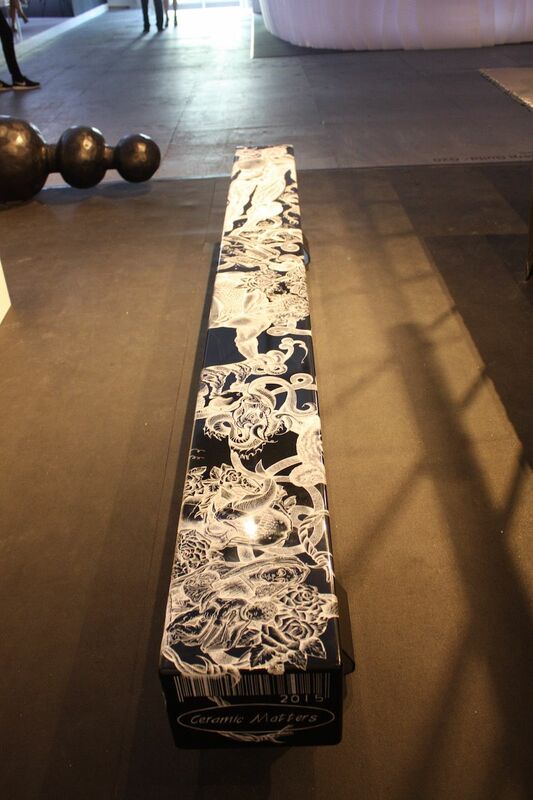 This fantastic bench from Ceramic Matters was a highlight of Cape Town’s The Southern Guild exhibit. It is a series of tattoo designs done up in ceramics by Gerhard Smart and Anthony Harris, who are known for their works that straddle traditional, classical ceramic forms and the dream world. Here’s a closer look at the imaginative designs. Mischer’traxler’s limited moths. Each individual brass moth is numbered and represents one moth still alive in reality. Each swarm (lamp) is unique. 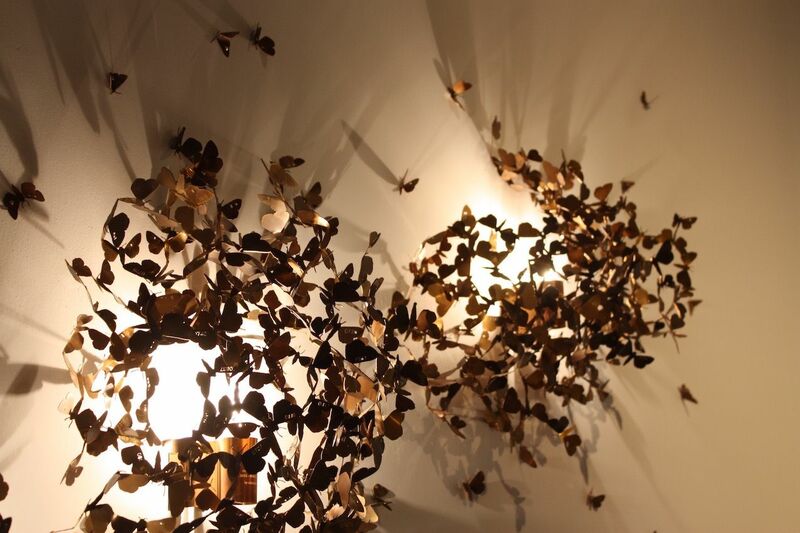 While there was plenty of special lighting at the show, we really liked these wall lights in the booth that are created from hundreds of individually crafted brass moths. Actually, Limited moths is part of the RealLimited series, which points out limitations in reality. The design is a portrait of the moth species Catcall converse, which is highly endangered in Austria. 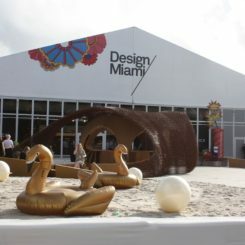 More than other design fairs, Design Miami/ has one foot in design and the other in art, perhaps because of Art Basel. 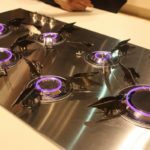 Regardless, Shumatsu Distortion has much so more to show you from the design fair as well as the art furnishings we found at Art Basel and other concurrent art fairs in Miami. 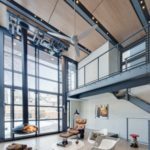 No, we can’t all afford the masterworks displayed, but they we can certainly draw inspiration from these design leaders for our own home design dreams and plans.